We’ve Outgrown Our Maternity Clothes Closet! No longer will you have to stand awkwardly outside the bathroom door to look through the available maternity clothes. 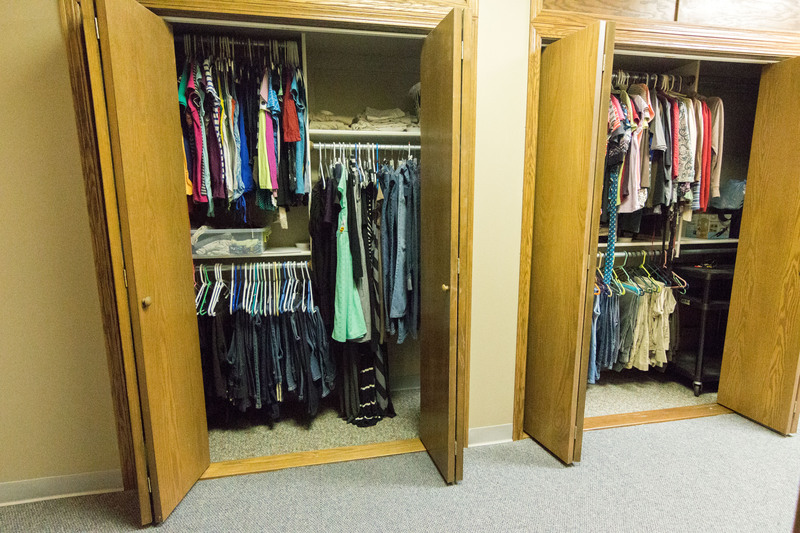 The closet has a new location and has more than tripled in size! The possibilities are endless. Previously, the space for our maternity clothes was about 3 x 7 foot. That made for a difficult time when trying to find a specific article of clothing not to mention size. And as mentioned above, it was also inconveniently located in the same narrow hallway on the way to the bathroom. (Not exactly an ideal environment for clothes ‘shopping’). For those new to Embrace, maternity clothes are one of our many free services offered to clients. Items can be checked out and exchanged during a pregnancy or kept as a one-time gift. All sizes and styles are dependent on supply but our staff takes great care to screen all donations for stains or pills, offering only the best to our clients. How do I get maternity clothes? In order to be eligible for maternity clothes you must first become a client. A client is anyone who fills out paperwork during an initial visit (whether for classes, pregnancy test or STD test). The second criteria would be that you are currently pregnant and in need of the clothes. Not sure if you’re pregnant? Come by during our walk-in hours and get a free lab quality pregnancy test. You can even schedule a free limited ultrasound if eligible to further prove the viability.